Sometimes I stop completely to understand anything about the current Russian metal-stage. How could that even happen that material released by a St. Petersburg's duo ARYAVARTA turned out to be actually needless and unknown to the wide audience. An album that could become a revelation has not been heard of… Sorry! Awfully sorry, in fact. However, this is not surprising to the guys. For example, their project MENZOBERRANZAN with a very original mix from black-metal and dark-wave passed by the public, as well as DARK PREDESTINATION, having not overcome the demo-period. 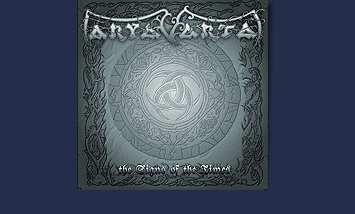 But ARYAVARTA has got a complete album at least, which they released by themselves though, that brings some optimism. In fact, this music mustn't melt in the emptiness of time. Although, looking at the lyrical concept of the album, such an outcome might be natural for the musicians: "Hundreds years have gone in a moment / Who does hear and follow wise teachers / Ancient books won't ever be read / Could it really be - everything is forgotten?" But no… To forget, for example, the music of MENZOBERRANZAN is still not possible to me. Neither the music of ARYAVARTA, I hope. The music that is likely woven from lots of elements taken from essentially different, probably even non-existing musical genres, and that sounds so naturally solid. Defining a style in which Veromir and Aldogor play is absolutely impossible: it has a bit of black, a bit of doom-metal, something little of dark-wave, a tiny bit of gothic, and elements of the medieval music are painted into the canvas of neo-classics with generously spread hints at opera vocals. Meanwhile the hearing of a power-metal or hard-rock guitar solo, fragments of Spanish flamenco or Russian romance is not surprising. A death-metal growling adjoins art-rock passages while progressive-metal guitar parts are followed by melodies likely coming from a repertoire of ABBA. Not a song resembles another song but all of them represent one music canvas. There is no even a hint at any seams, breaks or roughness. When you start thinking of how many components the music of ARYAVARTA includes then it messes up your head but the point is that you just enjoy the music when it flows, without bothering about its structure. This music is like a fine china vase which you just take and it gets broken. Like sheets of ancient manuscript, which are ready to get torn from a slight touching. Looking for analogues of this music seems to be very ungrateful as everything more or less resembling the album looks cruder and more primitive: maybe ENID, quite distantly RAKOTH's "PLANESHIFT", even more distantly - the early ANGIZIA… So everything is far away in both style and content. If you remove some parts away, not necessarily Veromir's dramatic tenor which indeed serves as a binding thread for many themes, and then everything should collapse like a house of cards but it does not! Of course, theoretically, all this could sound more volumetric, the drums could be far more "fleshy" while the sound of guitars could be denser... But somehow I am sure that the album would lose a lot of its beauty if it was recorded in expensive studio with hi-end equipment. A beauty slightly covered with sadness… With the sadness about disappearing ancient wisdom, about becoming needless philosophic teachings, about traces of bygone epoch turning to ruins… And even then "What's the evil / what's the good / Thou should recognize…" The only thing I would wish about this album is to listen to its Russian version. In my view, the Russian "Rainbow Hunt" sounds even stronger then in English... But remembering that no man is a prophet in his own country, the musicians could be right about this also.